Because of their Kesha, Sikh men tie up their hair like a bun and hide it inside a turban. They didn't want to be tripping over a long dhoti and they did not want to be caught without a weapon and that is why the Kacha and Kritipan. Guru Nanak, who was born in 1469, founded the Sikh religion. He was born at Talnandi village near Lahore in Pakistan, and it is the core of any Sikh pilgrimage. He came from a Hindu-Shatriya family. He was one of the many 16th century Poet-Philosophers known as Sants, who formed cults that introduced Islamic elements into Hinduism. Nanak advocated one god who is neither a Hindu nor a Muslim but simply "Sat" meaning truth. He rejected distinctions between men on the basis of castes and creed and asked people to look forward beyond these barriers. The Sikhs are opposed to caste systems and pilgrimage to rivers. Like Hinduism and Jainism the Sikhs prefer meditation to rituals. They worship at temples called Gurdwaras, baptize their children when they are old enough to understand the principles of the religion in a ceremony called Pahul and they cremate their dead. Their Holy book is the Granth Sahib, which contains the words of the 10 Sikh Gurus. Arjun, the 5th Guru in the early 17th century, wrote the holy book, Granth Sahib. Sikhism owns ten Gurus who were one in spirit, though different in body. They shared the same light and revealed the same truth. Their message was the same. They are revered equally by the faithful. This phenomenon of the ten Gurus of equal spiritual rank and sharing the same revelation is peculiar to Sikhism. The Gurus start from Guru Nanak to Guru Gobind Singh. Now the Guru Granth, the sacred book that was apotheosized by the last Guru before he passed away in 1708, fulfills this office of the Guru. A reformatory current known as the Singh Sabha movement, which arose towards the end of the last century attempted to recover the essence and purity of Sikh teachings submerged in the splendor of power. Like Hindus, Sikhs have no fixed congregational worship except on Ekadasi, the 11th day of the lunar month and on Sangrand or New years Day. Worship can be at the gurdwara or the house as long as there is a copy of the Granth Sahib. They practice tolerance and love of others and their belief in hospitality extends to offering shelter to anyone who comes to their Gurdwaras. They are one of the better-of groups in the Indian society. They have a well-known reputation for mechanical aptitude and specialize in handling machinery of any type, from auto rickshaws to Jumbo jets. Communal feasts are a common sight in the Gurdwaras. Outside the Gurdwara there is a flagpole called a Nishan Sahib, flying a triangular flag with the Sikh insignia. The Gurdwara is usually a whitewashed domed building with a prayer hall, kitchen and sometimes a school, clinic or hostel inside. When a Sikh arrives at his gurdwara, he may do Matta Takna, touching the steps and then his forehead out of respect, as one would respect his guru. Inside the prayer hall, the sacred text is the focal point, placed on a throne under a chanai, a canopy marked with the symbol of God, never an image. 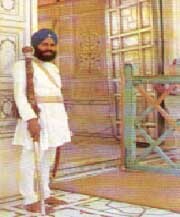 The Sikh approaches the throne on entering the gurdwara and performs by bowing and kneeling before it. He then sits on the floor joining the rest of the congregation. Men and women assemble together. There are always Ragis or musicians, both male and female, to perform kirtan while the faithful clap in accompaniment. The scripture is written in Gurmukhi language and printed in a form of Devnagiri script. Worshippers also bring offerings of money and food and some of them prepare the Langar, the community vegetarian meal of dhal vegetables, rice and chapattis eaten by all equally. Sikhism is an egalitarian religion. One must remove the shoes while entering the temple premises and covering of the head is also a must. The Golden Temple in Amritsar is the Paragon of the Sikh temples. 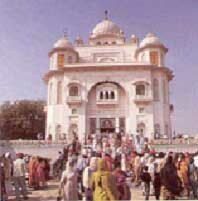 This holiest shrine of Sikhism, also known as Hari Mandir, blends Hindu and Muslim style of architecture.